Best Organic Crib Mattress - What You Need to Know | Organic Essentia Mattress Inc.
Natural crib mattress manufacturers like Essentia have chosen to do something about the lack of well-made and best organic crib mattresses on the market. Essentia is very transparent with the manufacturing of our natural crib mattressesbecause we take the greatest of care using only the best materials, to ensure that our mattresses are well-constructed and consist of natural and organic materials. In fact, all of our products are manufactured in our GOLS (Global Organic Latex Standard) and GOTS (Global Organic Textile Standard) certified organic factory. Our main goal at Essentia is to produce the purest and safest sleep surface so your baby can get a good night sleep. The top layer of the LaLa natural memory foam crib mattress features Essentia's patented natural memory foam, produced at a firmness that is generally recommended to offer just enough comfort for baby while still meeting all safety standards for a crib mattress. The high-density foam is different from standard spring mattresses because it doesn’t allow for dust mites to take residence. Dust mites are the number one cause of allergens that have a severe impact on sleep quality. Other mattresses are not made with organic materials and may contain flame retardants and other harmful chemicals that affect your baby’s health. 100% organic cotton is what we use to cover our natural baby crib mattresses, and organic dyes for the styling of our custom Zebrano mattress covers. If you buy a baby mattress made with standard cotton, it can contain bleach and other chemicals which can stimulate baby's central nervous system. These toxic chemicals in a standard crib mattress can be harmful to your baby's health. Our removable waterproof cover, the Stinky Pad (sold separately), eliminates the need for any plastic, PVC or chemical based waterproofing on the mattress itself. Natural latex memory foam mattresses are naturally deterrent to dust mites, not having any of the components in them that dust mites are naturally attracted to. Knowing your baby's mattress doesn't have dust mites in them will not only help your baby sleep, but you'll get a good night sleep as well. Dust mites thrive in natural fibers such as wool, coconut, and cotton as well as polyester batting. The fibrous material is nesting grounds for dust mites. Since the La-La natural crib mattress, like all Essentia products, has been designed and tested to not attract or emit allergens you can be sure your baby is on a safe sleeping surface. Essentia products were tested by Dr. Robert G. Hamilton of the Johns Hopkins School of Medicine, you can read more about these tests here. At Essentia we don't use any adhesives at all in our natural crib mattress. The 2 layers of organic materials are simply wrapped in an organic cotton cover. Other companies that use cheap glues contain toxic chemicals that are harmful to your baby’s health. Yes, a natural memory foam crib mattress is more expensive than a standard crib mattress. But there is a reason for that. 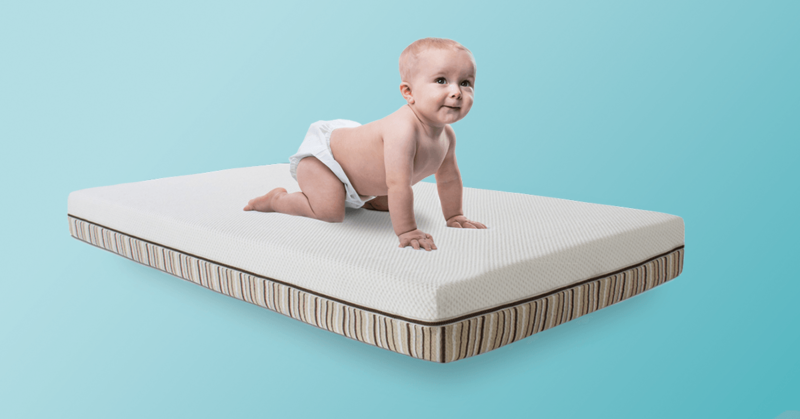 A lot of care and special materials go into its manufacture, making it not just a natural mattress, but a better, healthier mattress for your baby and peace of mind for you. Spring mattress or memory foam mattress?